The practice of celebrating Junior Week, an annual Thanksgiving program of athletic, social and musical events, gradually developed in the 1890s, becoming a fixed custom by 1906. According to the November 12, 1906 Pennsylvanian, the purpose of Junior Week was “to make the old campus so interesting and attractive that none of the out-of-town students will consider for a moment the question of going home over the holidays”. The week always culminated with the annual Army-Navy football game, held in Philadelphia. 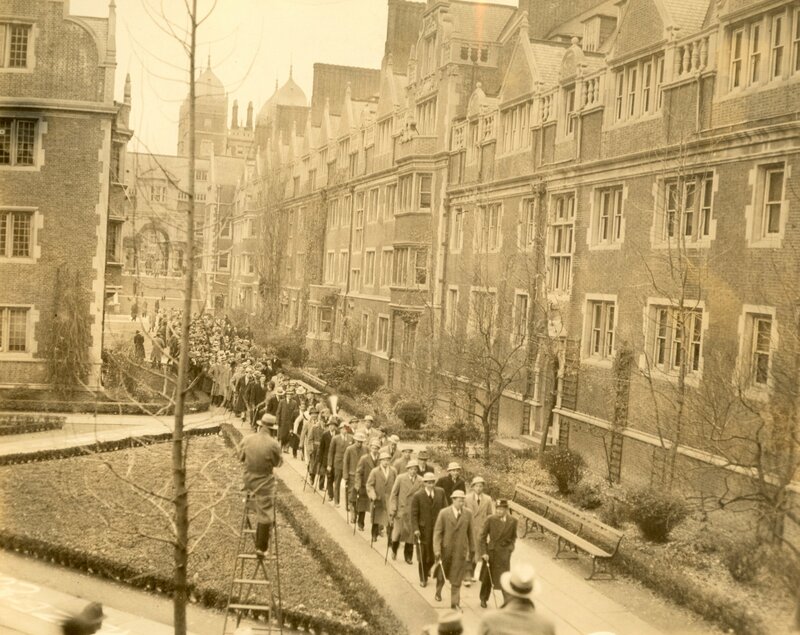 A Junior Cane March was not added to the program of Junior Week until after WWI, around 1918. The entire Junior Class assembled in the Big Quad at 7 o’clock, where University and class songs were sung, after which the students marched through the lower arch of the quad to the Houston Club for chapel exercises. At the time, it was customary for every junior to carry a cane during the week of festivities. This tradition most likely developed from the 19th century practice of presenting juniors with Junior Class Canes, which were ordered and distributed much like class rings are in the present. Since the custom of every junior carrying a cane during Junior Week had already been established by the time of the Junior March, it was only natural that the juniors parade with their canes. In the early years of the Junior Cane March, canes were designed and ordered ahead of time. They were made of solid mahogany, and had an inch and a quarter black bone ferrule. Near the head was a silver band, one and a quarter inches deep, on which students could have their initials and class numerals engraved. In 1923, the cost of such a cane was $3. The Junior Cane March remained a part of Junior Week until 1959, when the traditional Navy football games, began in 1888, ended. It was then reinstated in 1965, but as a part of Hey Day, held in May.